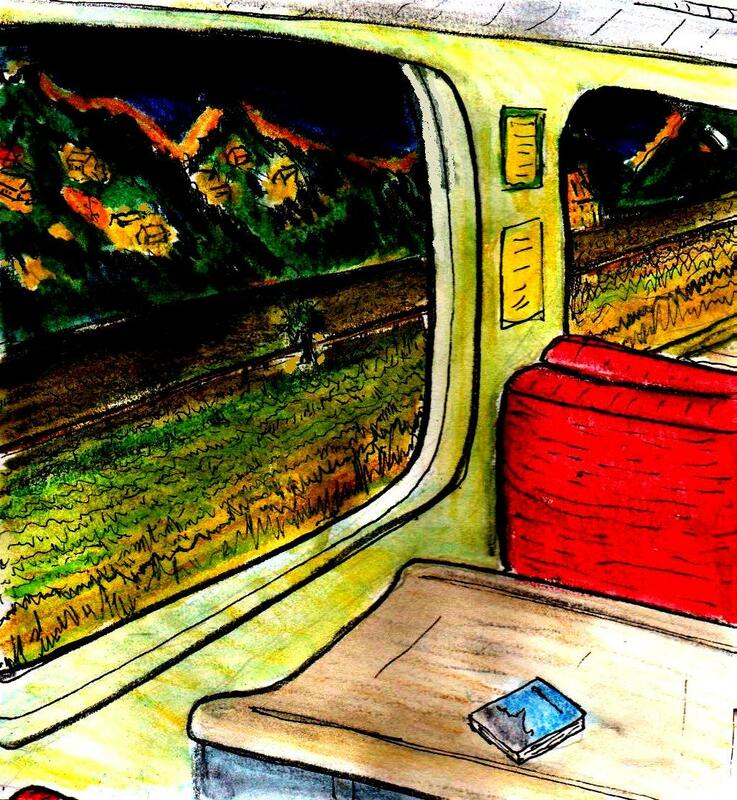 Well, I was in the mood for painting landscapes again and – the night before I painted this- I suddenly remembered a train journey from Shrewsbury To Aberystwyth I took in 2008. Anyway, at one point in the journey, I saw these houses on the hills beside the railway track and – since it was night, all of the houses were lit up in a way that reminded me of a Christmas card. It looked really beautiful. As usual, this painting is released under a Creative Commons BY-NC-ND lience. 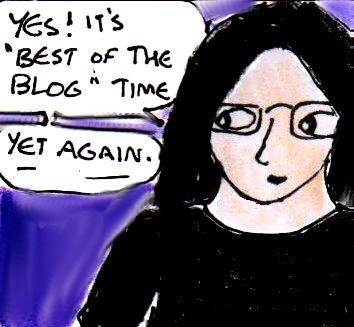 Well, it’s the end of the month and this means that it’s time for another “Best of The Blog” post. I should also point out that, for various reasons, this monthly feature will probably be changing into a “top ten” list from September onwards – but I’ll probably explain more at the end of next month. For people who are new to this blog, these posts are a collection of links to all of the articles about art, comics and writing (excluding reviews and daily art posts) that I’ve posted here over the past month. All in all, this month has gone pretty well – although I seem to have drifted towards writing more art-based/ general creativity-based articles than writing-based articles. This might be because I’m making lots of art and writing pretty much no fiction whatsoever these days, but I don’t know how long this will last because although I have more recent art experience, I have more intellectual knowledge about writing fiction (and storytelling in general). Whilst I don’t plan to review literally every episode of the new series of “Doctor Who”, I’ve just finished watching a recording of the latest one (since I missed it when it was originally shown on Saturday evening) and I thought that I’d take a look at it here. But, before I go any further, I should point out that this review will contain SPOILERS. You have been warned. “Into The Dalek” starts out in spectacular fashion with a fighter pilot called Journey Blue trying to outrun a Dalek mothership in an asteroid field. However, the Dalek ship is gaining on her and it manages to fire on her ship. But, a second before her ship explodes, the TARDIS appears and the Doctor rescues her. After the Doctor returns Journey to a nearby military ship called the Aristotle (which is hiding behind a large asteroid), the captain of the Aristotle wants to kill him in order to keep the location of the Aristotle secret from the Daleks. But, once the captain learns that the mysterious guest is called “The Doctor”, he decides to spare his life because there is a medical matter that his crew needs help with. 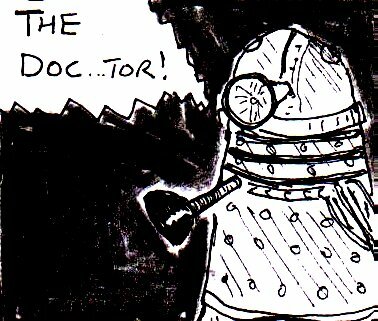 The soldiers lead the Doctor to a room, which contains a malfunctioning Dalek that is leaking radiation. To the Doctor’s astonishment, the Dalek actually seems to possess a rudimentary conscience and it wishes to join the humans in their war against the Daleks. So, after returning to Earth and finding Clara, The Doctor returns to the Aristotle where, along with Journey and a couple of other soldiers – they are miniaturised into order to go into the Dalek (hence the title of the episode) and repair the radiation leak that threatens it’s life…..
One of the first things I will say about this episode is that the set design is absolutely amazing. Seriously, the Aristotle looks like something from “Aliens”. Not only that, the scenes set inside the Dalek are especially cool and they have a very grimy and industrial “Blade Runner”-like look to them too. The writing in this episode is fairly good, although the story is a lot more “serious” than most episodes of the previous series were and there is a lot of heavy-handed introspection about morality, ethics and war. As a fan of military sci-fi shows like “Stargate SG-1” and “Battlestar Galactia”, I was kind of interested to see how a (mostly) pacifist character like The Doctor would react to these kinds of situations. Another interesting theme in this episode is how the Doctor reacts when he sees a “good” Dalek for the first time. Since he has spent most of his life fighting with the Daleks, this really freaks him out and he spends most of the episode trying to work out whether or not he can trust the Dalek. And, yes, the episode gets a lot of drama out of all of this stuff – especially in one brilliantly ironic plot twist about three-quarters of the way through the episode, just after the Doctor links his mind to the malfunctioning Dalek’s mind (in an attempt to show it everything good that the Doctor has ever seen). It’s probably just my extremely twisted sense of humour, but I found this scene absolutely hilarious. In my review of the first episode of this series of “Doctor Who”, I mentioned that I wasn’t sure whether Peter Capaldi was a good choice of actor to play the new incarnation of The Doctor. If “Into The Dalek” is anything to go by, he might make a fairly good Doctor – yes, he’s grumpy and cynical (and probably interprets the role in a more “old school” kind of way), but he has all of the eccentricities that you would expect from The Doctor. Also, it might be the different chemistry between her and the new Doctor, but Clara isn’t really as much of a likeable character in this series as she was in the last one. And I was kind of disappointed at the end of the episode when The Doctor declines Journey’s offer to be his new companion because he doesn’t like working with soldiers. Seriously, now that the Doctor is more gloomy and cynical, it just somehow makes a lot more sense for his companion to be a badass fighter pilot rather than an “ordinary” schoolteacher. All in all, this is an extremely good episode of “Doctor Who”, with lots of drama and some absolutely brilliant set design. Yes, you probably have to have watched at least a few other episodes of the show to get the most out of this episode (since it relies fairly heavily on the mythology of the show), but it’s still one of the best episodes that I’ve seen so far. If I had to give it a rating out of five, then it would get five. Well, I am very proud to present an interview with Kate Robinson – a published writer and freelance editor born in Iowa and residing the past few decades in Arizona and California. She runs the “Jellyfish Day” blog (of which I was lucky enough to post a guest post on there last year) and who has recently published an alternate history /sci-fi/thriller novel called “Heart Of Desire – 11. 11.11 Redux“. We studied writing together in Aberystwyth in 2009/10 and, whilst I haven’t really written that much fiction since then, Kate has worked on a lot of different fiction and nonfiction writing and editing projects – including a short story collection collaboration with another Arizona writer, Joe DiBuduo (a more comprehensive list of stories which Kate and Joe have worked on can also be found here). – So, you’ve got a new novel out – can you give us a brief summary of what it’s about? The plot basically revolves around an investigative reporter, Tess Vaughn, who literally jogs into the arms of a married presidential candidate, Senator Harris Henry. They have a campaign trail affair that brings her trouble galore. As Henry nears his successful bid for the presidency, he confides strange things to Tess about a UFO disclosure and a dark political agenda by a shadow government. When she breaks off the relationship, she finds herself pregnant, and flees to a small community in rural Arizona where she secretly bears President Henry’s lovechild, Mikka. Tess soon discovers that Mikka has talents that both delight and scare her. She fears Mikka will be exploited and realizes that someone is interested in Mikka for their own ends. As she flees her home and seeks the help of a pair of New Age ministers, Marshall and Savannah Updike, and a Native American healer, Carson Hodges, she comes to understand that Mikka’s fate is linked with President Henry’s, and in a spiritual sense, to the cosmos. -The 11.11.11 thing is certainly an interesting subject for a story, can you explain it to our readers? In the novel, I refer to the date of 11 November 2011 as “the window of positive opportunity” that is a precursor to 21 December, 2012, the “end” of the Mayan calendar. 11.11.11 is significant to the plot as a point “where cosmic transformation began.” New Age thinkers attributed this date with a powerful shift in human awareness. 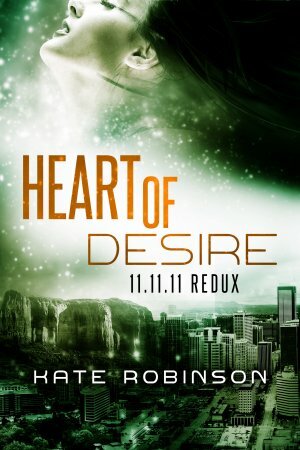 – How did you come up with the title of the novel, since “Heart Of Desire” doesn’t immediately sound like a sci-fi/thriller novel? While Heart of Desire isn’t a genre romance, it does have strong romantic elements as told through the POV of the protagonist, Tess and also through the viewpoints of the two men she’s attracted to who are 180 degrees apart in their lifestyles and viewpoints. But there are two layers to the story. Thematically, the story explores the concept of desire as an emotion or force that often brings us suffering no matter the positive intention. One premise of Buddhism is that our desires, no matter how positive, often bring us more than we bargain for. Be careful what you wish for, as the saying goes. Every character in the novel has a particular desire or set of desires that drive their lives to cross in a dramatic conclusion. – Although I understand that “Heart Of Desire” is an updated version of an older story that you wrote, I absolutely love the optimistic 1980s/1990s-style atmosphere of what I’ve read of it so far. I was wondering if classic TV shows like “The X-Files” had any influence on you when you originally wrote the story? Actually, I saw only an episode or two of The X-Files during the years it aired because when I started the story in 1999, I lived in a high desert valley in Arizona where television reception was sometimes sketchy without cable TV. It wasn’t until the winter of 2009-10 when I worked on a draft in the UK that I sat down down with the entire DVD collection of The X-Files episodes and watched them all – great fun! 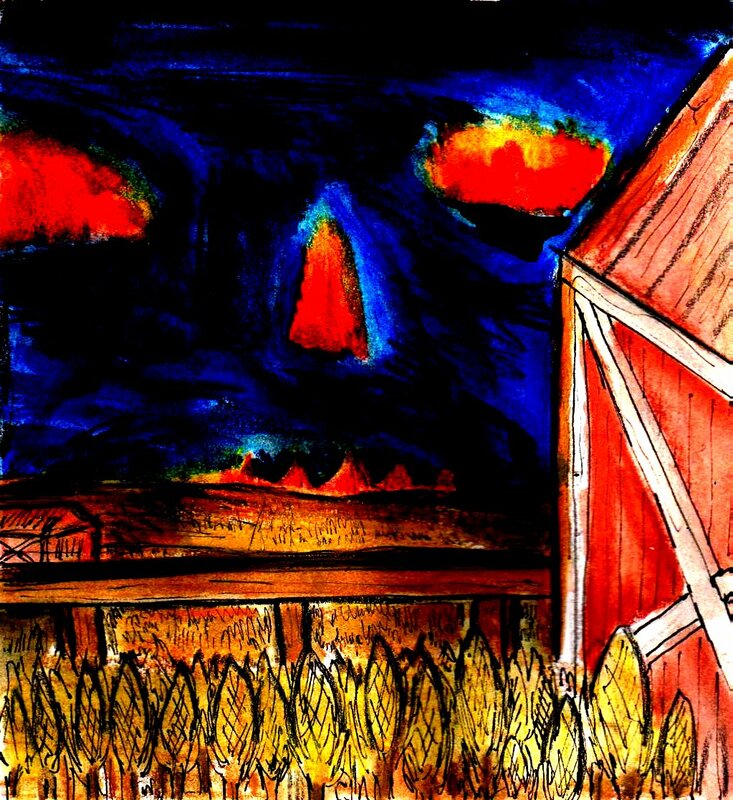 I’ve had a long interest in reading accounts about UFOs and alleged extraterrestrial abductions because of some strange experiences I had in my childhood, and later on, when my kids were small. So my fiction was influenced very much by personal experience and by writers like Whitley Strieber, who had some rather strange experiences with UFOs and ETs and who writes both nonfiction and fiction based on his personal experiences. I also read many other accounts relayed by abductees or witnesses of UFOs to ghostwriters or therapists who worked with them. For many years I also subscribed to a newsletter called Cosmic Awareness Communications that consisted of readings relayed through a trance interpreter, a channel very similar to the Edgar Cayce readings. All this information is now archived on a CAC website and there is still a current interpreter of Cosmic Awareness who does general and personal trance readings. While CAC readings covered many topics, the readings about various ET groups who visit Earth always captured my imagination and seeded many scenes in the novel. I’m probably also influenced by other more fanciful sci-fi books and films I’ve absorbed over the years, like Stranger in a Strange Land, The Martian Chronicles, ET, Close Encounters of the Third Kind, Independence Day, Men in Black, War of the Worlds, and many others. My novel focuses on the gray and reptilian ETs that humans encounter around the globe. – For a novel that was originally written in the late 1990s, it’s remarkably forward-looking. There’s a multiracial president and a mysterious unaccountable US Government agency called the NIHSA. As the years passed, I incorporated current events, as well as creating some alternate history scenarios that could have plausibly happened. As they say, the future is never fixed and we can follow many threads to estimate what might happen next. – Although you include a brief reference to 9/11 when describing the NIHSA and the president comes across as being vaguely Bill Clinton-like, I was wondering how much of this stuff was in the original story and how much was added when you updated it before publication? When I started the story in 1999, I based the goings-on in Washington, D.C upon the Clinton administration. By the time 2008 came around, it seemed natural to upgrade the story with a more multiracial cast of characters based on the Obama administration. – “Heart Of Desire” deals with a lot of environmental topics and I was wondering how you were able to turn what some might consider a “long-term” issue into something more immediate and compelling? Thank you – I’m pleased that you found this aspect of the novel interesting. Our current environmental woes began to physically emerge in the late ‘80s and early ‘90s, if not before, on a less tangible level. At least this was noticeable in various places I lived around Arizona. We had clockwork summer and winter rainy (or snow) seasons in the 1970s, a long-term pattern that gradually morphed into serious drought. The varied desert environments at different elevations in Arizona always had their peculiarities like a wide range between daytime and nighttime temperatures, but that became more pronounced when high summer temps became higher and the nighttime and winter lows became lower. I began to notice that wildlife was disappearing when I went on some camping trips during the ‘90s into semi-remote places and saw few birds or critters, a strangely silent world. Later, the unusual and fierce storms started. Of course California may be even more impacted by drought now than Arizona. The city where I live now is implementing a one-day a week lawn watering restriction, along with carwashing and hose use restrictions on October 1, 2014. People here are used to having green manicured lawns that are watered at least every other day, if not daily, in some cases. Of course, southern California has the warm Santa Ana winds that happen along with particular ocean currents, and that often results in fires in the wooded hills and canyons in and around our cities, and we’re in more in danger than ever from those. And from the mudslides that happen after large rainstorms – we’re not having much rain but climate chaos does bring flooding rather than normal rainstorms. Earthquakes seem to be coming at a faster rate than ever all over the world, and California has many faultlines and is famous for quakes. Over the course of writing and revising, and then formatting Heart of Desire for publication, the emerging long-term environmental issues here and all over our planet have certainly became more immediate and compelling! My natural concern about this issue was easy to include in the story. – As someone who is a bit of a “loner” when it comes to creating things, can you tell me a bit about what it’s like to work collaboratively? Writers who collaborate have many different styles. I’ve seen some do novels together by writing alternating chapters. I suppose some have actual physical meetings to discuss and critique each others’ work, as writers do in critique groups or in the entertainment biz. In our case, Joe wrote drafts of stories and developed and polished them to the best of his ability. When he hit the wall with them, I received the collection via e-mail and further developed them, adding my own touches. Joe has the vivid, soaring imagination and I have the wordwhacking toolkit and don’t mind the nuts and bolts of submission to publishers and agents. So I never had to sacrifice my reclusive ways. So many writers are introverts and charge their batteries in solitude, but I think we’re all connected at the level of mind and spirit anyway. – Finally, do you have any advice that you can give to new writers? While I don’t necessarily think that doing what you love will always make money follow, I feel if writing is your passion, then jump into it wholeheartedly. Creativity is both a joy and a solace in a reality where pain of various sorts is also a constant. So live the writing life with every heartbeat and every breath. Set aside a little (or a lot!) of time each day or write as regularly as possible. Read more than you write and in many genres and styles. Read books and articles and blog posts by authors and editors about the mechanics of the writing craft and about the writing life. Don’t be afraid to experiment and never give up – it’s only through trial and error and constant practice that you’ll progress from the level of emerging writer to seasoned, professional writer. Build your platform, your social media contacts, and network with other writers as you learn the craft – this business is built upon these connections and interactions. And if you don’t succeed as a published author, then at least you’ve had a heckuva run doing something you love. Thanks 🙂 If anyone is interested, more info about “Heart Of Desire” can be found here. Well, since I didn’t feel like painting another landscape or making a “traditional” cartoon painting, I thought that I’d experiment with painting silhouettes today. 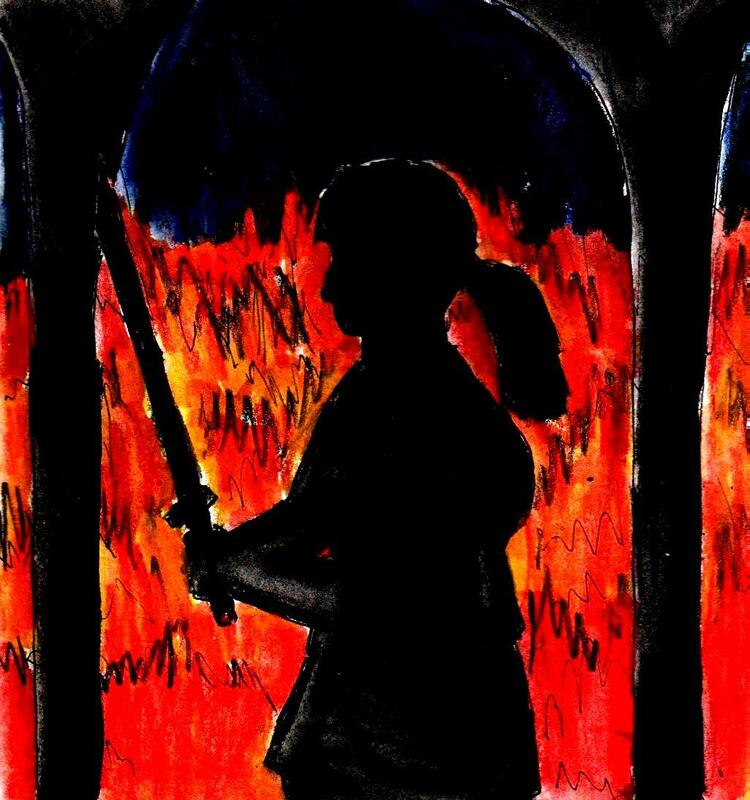 However, despite the fact that I edited this picture digitally after I scanned it, the original painting actually looks slightly better than this digital version. Well, since I miscalculated the number of days in this month (Why does August have 31 days? It makes no logical sense!) I needed to come up with one more article than I expected to. Anyway, this made me think about the whole subject of writing and drawing filler material. Not that this fine article is a filler article, of course…. Since I’ve already written about this subject last year, I thought that I’d list a few more clever ways of adding filler material to your webcomic, novel, website, DeviantART page, serialised story etc… today. However, I should point out that this guide is mostly geared towards online-based things rather than traditional print media. As I said last year, you should be careful not to add too much filler material to anything that you create – because it will “dilute” your work and too much filler will make people lose interest in whatever you are creating. 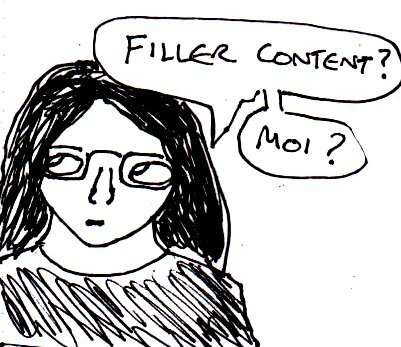 1) Sketchbooks And Notes: This technique will only really work if you’re posting things online at regular intervals (eg: a webcomic, a serialised story etc…), but it can be one of the best ways to add some quick filler material if you’re worried about missing an update. Basically, just scan/photograph a few pages from your sketchbook (if you’re making a comic) or type up some of your early story planning notes (being careful to avoid spoilers) and then use them for an update. Yes, you’ll have to write a brief introduction but it requires a lot less time and effort to make than a regular update for the simple reason that you’ve already made most of the stuff you’re putting in your update. Not only that, it’s one of the best types of filler for the simple reason that, if you have any fans who follow your work, then they’re probably going to be fascinated by the creative process that goes into making your webcomic or story. So, giving them a tantalising glimpse into your private sketchbooks/notebooks will help to satisfy some of their curiosity. 2) Competitions: You’ll have to use your imagination here, but a good way of coming up with a quick update is to post a competition of some kind for your audience. Because you’re posting something on the internet (with an international audience), it’s probably best to give out intangible prizes rather than having to post physical prizes to audience members in other countries. Good ideas for intangible prizes include things like, adding the winner’s name to your novel as a background character, sketching the winner in the background of one scene in your comic, just saying that this person has won first prize etc…. Not only does this increase audience loyalty to your website, but if you get your audience to post their entries (or links to their entries) in the comments on your site, then you can come up with lots of stuff for people to look at – without having to create any of it yourself. 3) Fictional non-fiction: If you’re writing a novel, then you can add filler by including a scene or segment of your novel where either you or one of your characters explains some trivial part of the world of your story. Because you’ve probably already thought about this sort of stuff before, then there hopefully won’t be too much new creativity involved in creating one of these scenes. For example, if you’re writing a fantasy novel, then you could include a few short “The Almanac of (your setting)” chapters throughout your novel that explain some of the weird and wonderful things in your story in more detail. A good sci-fi example of this technique can be found in the “Game Cat” chapters of a cyberpunk novel called “Vurt” by Jeff Noon. Just don’t use this technique too often, because it goes against the “show, don’t tell” rule for good descriptive writing. 4) Alternative comics: I found this interesting horror comic online a few weeks ago and, although there has obviously been a lot of creative effort put into it, one of the interesting things about it is that one chapter of it doesn’t really look like a traditional comic. In fact, most pages of this chapter consist of nothing but “voice-over” dialogue and a single minimalist background image and/or pattern. So, if you need to make a quick comic- then it might be worth trying this approach. Yes, you’ll still have to put a lot of effort into the writing, but it means that you can either make quick and simple art for each page or just use old public domain/ Creative Commons licenced images from the internet. Yes, you’ll have to search for the right image for each page (and check it’s copyright/ licencing status) but it will save you having to create lots of art from scratch. Well, I was still in the mood for painting landscapes, but I was also in the mood for making some melodramatic American-style horror art too – and this painting is the result. Unfortunately, it didn’t even look half as dramatic as I had hoped it would do.